How easy is it to find authentic Asian ingredients in America? Top San Francisco chef Charles Phan finds out when he trolls a Safeway supermarket, his kids in tow, to buy groceries for a lovely Vietnamese lunch. 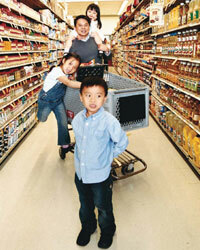 Charles Phan, the chef and owner of the Slanted Door in San Francisco, is shopping at the Marina Safeway with his three children—Pana, 3, who takes the place of honor in her father's arms, Panu, 5, the only boy, and Nati, 6, who views her job as eldest with a serene but stern seriousness. "Are these yours?" I asked Phan when we first met. "No, I rented them," he answered, deadpan. With kids dripping from his arms and legs, Phan begins his Safeway tour of Asia with the obvious. "Lemongrass—they never would have had that here 10 years ago. Taro root. I boil that for dessert, you know, and make fried chips." He picks up a yuca root, which looks like a yam's ugly stepchild, but before he can comment, Panu chimes in. "Yucky," he says, chuckling at his pun. Phan lets Panu know his opinion has been heard, then sees something—it resembles a pale, bumpy cucumber—that excites him. "Bitter melon. I put it in soup. It's superbitter!" Back in the kitchen after the trip to Safeway, Phan unpacks the bags of groceries and transforms some of the ingredients into lunch for his family, starting with banh mi, Vietnamese sandwiches: tender sliced pork topped with vinegary shredded carrot, whole cilantro leaves, thinly sliced cucumbers and a sprinkle of soy sauce, all piled on crusty rolls. "I scoop out the insides of the roll so I'm not chewing a lot of bread with my pork," Phan says. He also serves bowls of pho, an aromatic chicken soup with rice noodles, basil, lime and jalapeños. We are joined at the table by Phan's wife, Angkana, and his mother, Quyen Phan. Almost everyone in Phan's extended family works at the restaurant—22 Phans in all. Angkana is office manager. The two married in 1995, the same year they opened the restaurant that would bring the family success after decades of upheaval. Phan's father was born in a farming town in China, where his family grew sugarcane and turnips. At age 16 he was sent with a brother to work with a great-uncle, who helped him become a successful merchant and landowner. In 1951, fearing arrest or worse as the Communists consolidated their power, Phan's father took off, on foot, for Vietnam, leaving his wife and children behind. In Vietnam, Phan's father started a new family and, once again, built a successful business as a merchant. Born in 1962 and raised in a central highlands town north of Saigon, Charles Phan grew up in a war-torn country that he says was nevertheless "pretty normal." "As I grew older, it got worse," he says. "There were land mines. Kidnappings were rampant." But even when a neighbor's house was bombed, the family never foresaw having to leave Vietnam. Once President Nixon resigned, Phan recalls, everything changed. Saigon fell on April 30, 1975, and that day the Phan family—Charles and his five siblings, his mother, father, aunt and an uncle who had fled China with his father—got on a ship with 400 others. They weren't even sure where they were going. "We lost everything—we couldn't take anything out," says Phan, except some powdered milk from their storehouse, which sustained them for three months on the ship. They wound up in Guam, where they stayed for a year and a half, living first in a refugee camp and then with a couple for whom they worked. The family finally made it to the U.S. in 1977 and settled in the Tenderloin District of San Francisco. Phan's father got a job as a janitor in a pub, and Phan, 14 and in high school, worked a few days a week as a busboy at the same pub until he graduated. Of his years at Mission High he says, "I was not a normal kid. I have no memory of even a football game. Things like that didn't exist for me." He studied architecture and design at the University of California, Berkeley, partially to please his father. He worked for an architecture firm in Manhattan, then helped his mother run a sewing-machine company. It would take Phan many years to get back to the restaurant business. In 1992 Phan visited Vietnam for the first time since childhood; he was overwhelmed. He thought of staying but couldn't bear the idea of leaving his family behind in the States. Back in California, he had a brief period of unemployment, during which he hung out and cooked for friends. He couldn't shake the idea of opening a restaurant. "I was wondering, 'How come there are no Vietnamese restaurants with ambience?'" he says. "I'd go out to eat and think about how I wanted to change the salt and pepper shakers." By 1994 he had found a space on Valencia Street in the Mission that three or four other people were bidding on. "I just went into this kind of survival mode. I had $30,000 to my name at this point. I signed a check and took it to the owner, bypassing the agent entirely. He was still showing the space after I bought it." There Phan created a Vietnamese restaurant that was unlike any other in town—a modern space with a serious wine list and authentic cooking that was fresh and sophisticated. Taking the dare of a friend, he named the restaurant with a sly reference to an Asian stereotype. The door, in fact, was not at all slanted. Right away, Phan became noticed for his bold flavors. He likes to cook with brief blasts of heat; his recipes often use the phrase "heat until small puffs of smoke appear," as when he sautés chunks of chicken with lemongrass and chili paste or stir-fries eggplant with onion and garlic before braising it in coconut milk. His recipes aren't difficult, but some of them, like his shrimp and jicama rolls with spicy peanut sauce, become easier the more you make them. Phan's hope is that, more than just developing a familiarity with individual Asian ingredients, Americans will embrace an Asian way of thinking about food. "Instead of focusing on a big hunk of chicken or steak," he says, "I would like people to see meat as a kind of condiment, as Asians do. It's just a beautiful, healthy way of eating." The Slanted Door, 1 Ferry Building #3, San Francisco; 415-861-8032. Laurie Winer, a writer living in Los Angeles, is a regular contributor to the Los Angeles Times food section.